Peers representing executives, security officers, and healthcare privacy advocates will join to discuss the topics that matter most to them. Conferences can be great, but attending focused sessions with your peers is really where we all get the most value,” said Richard Greenberg, ISSA Fellow and Summit Chair. The Los Angeles Chapter of the Information Systems Security Information (ISSA-LA) is excited to offer professionals in the Greater LA and Southern California area a dedicated pair of forums where they can meet with their peers to discuss the challenges they face, the best practices they’ve employed, and the opportunities ahead of them as the cybersecurity landscape changes right under our feet while we try to run our businesses and our lives. 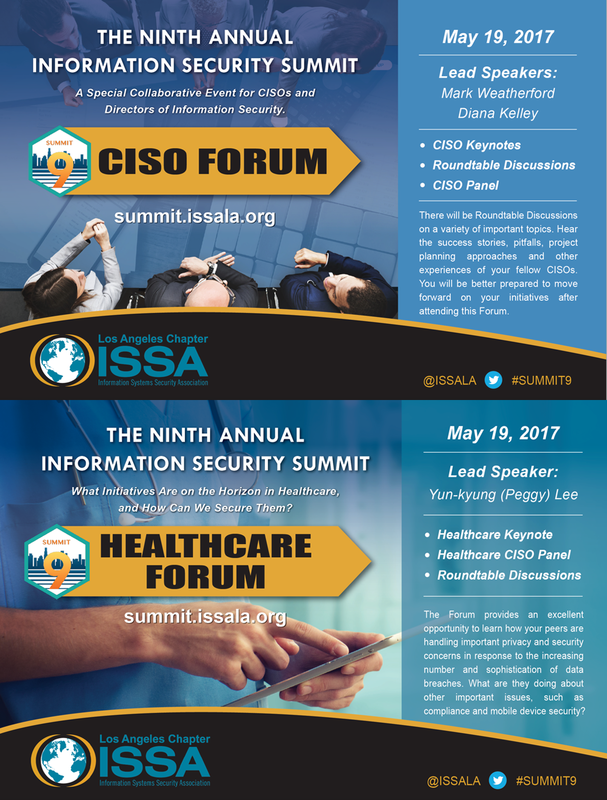 The CISO Forum, and the Healthcare Privacy and Security Forum. The Forums are a part of the exciting ISSA-LA Security Summit scheduled to take place on May 18th - May 19th at the Universal City Hilton in California. Training kicks things off on May 18, with keynotes, sessions, and forums slated for Friday, May 19th. For those interested in engaging with other experts from the InfoSec and vendor community, the Summit is a great place to do so. There are several breaks available throughout the day to meet with our sponsors and your peers. Since ISSA-LA is all about the community, registration for the event is open to anyone interested in learning more about information security. The Information Security Summit is part of ISSA-LA’s important community outreach program. The goal of the program is to help our community stay safe from cybercrime by enabling the necessary collaboration between business and community leaders, technical IT professionals and the information security community. For a limited time, there’s an opportunity to save a bundle with one of the discounted promotional rates. But hurry, these rates won’t last forever. DISCOUNT - GENERAL ADMISSION: Sign up today to get the special early bird rate of $125 for May 19th only, the Summit Day, which includes the specialized forums. Plus, you’ll get to hear from our great lineup of speakers slated to open and close the summit. This sale ends on April 30th 2017. After this date, prices will increase to $175. DISCOUNT - SECURITY TRAINING + SUMMIT: Want both the training AND the Summit day? We have four great full day classes at a ridiculously low price. Register today for only $375 for both days, May 18th and May 19th. You’ll have access to both the Training session you select and the Summit Day - which includes the specialized forums - for one low price! This sale ends on April 30th 2017. 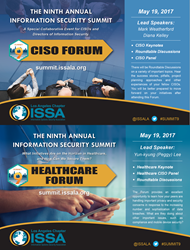 For more information on ISSA-LA Summit 9 and for registration details, please visit http://summit.issala.org/. The Information Systems Security Association is a not-for-profit, international organization of information security professionals and practitioners. It provides educational forums, publications and peer interaction opportunities that enhance the knowledge, skill and professional growth of its members. The primary goal of ISSA is to promote management practices that will ensure availability, integrity and confidentiality of information resources. For more information or to register, please visit: http://www.issa-la.org. Join the movement today!